Humanity encountered sin when Adam and Eve died spiritually in the Garden of Eden and their fellowship with Jesus was broken. The law of God provides us with the knowledge of sin and this is why Paul told us to rejoice in the atonement provided by the cross. Noah and Abraham each had a personal covenant with God but only the First Covenant provided atonement and a promise concerning the land of Canaan that depended upon the behavior of the Israelites. The land covenant was voided by God when the Israelites failed in their obligation. The atonement of the First Covenant came to an end when Jesus died on the cross and made eternal amends for the sins of mankind. 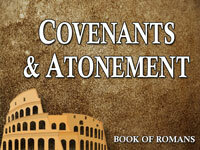 This ushered in the Second Covenant, which was an eternal agreement between God the Father and God the Son. It is perfect because both parties are able to keep the requirements and mankind does nothing but accept the finished work. God the Father reconciled humanity to himself with the death of his dear Son and the only way to enter into the Second Covenant is to be born again.